14 trails, beginner through advanced, 5 lifts, 1,100 foot vertical – third highest vertical south of New York State ! Snowboard park. 100% snowmaking. 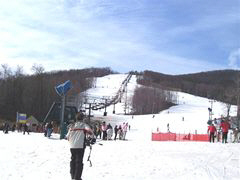 Near Harrisonburg , VA.
28 trails including a 1 1/2 mile long trail, beginner thru expert, 12 lifts including a quad chairlift. 700 ft. vertical. Half pipe & terrain park. 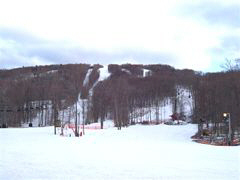 Near Somerset , PA.
16 trails, beginner through expert, 10 lifts including 2 quads, 600 ft. vertical, 100% snowmaking. 3 snowboard parks, half pipe. 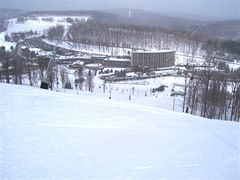 Near Harrisburg , PA.
Hugh resort complex, 750 ft. vertical, 31 slopes & trails, 6 passenger high speed chairlift, 3 quads & 5 triples. Snowboard park. 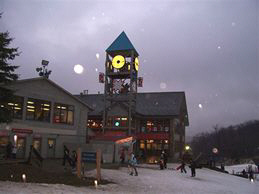 Near Somerset , PA.
1600 ft. vertical, 53 trails over 3 mountain areas, 11 lifts including a high-speed quad, terrain park, huge snowmaking system. Near Kingston , NY . Highest peak in southern Vermont with 2,003 ft. vertical, 90 trails including 2 incredible 100 yard wide supertrails, 14 lifts including the Stratton Starship XII high speed gondola, 4 high speed six passenger chairs and 4 quads. 5 terrain parks. Great snowmaking. Near Brattleboro in Southern Vermont . 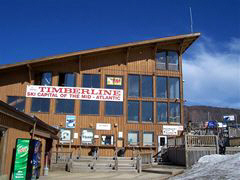 Big ski area with 43 trails, 1334 ft. vertical and 10 lifts including a high-speed quad. Near Manchester Center in Southern Vermont . Giant ski area with 1,700 ft. vertical, 104 trails over 4 mountain areas. 19 lifts including 3 high speed quad chairlifts. 4 terrain parks. Great snowmaking. Near Brattleboro in Southern Vermont . Largest ski area in the Eastern U.S. , 3,050 ft. vertical, 200 trails, 33 lifts including 2 high-speed heated express gondolas & 6 high-speed quads, 7 mountain peak areas, 5 terrain parks. Extensive snow making system. Near Rutland Vermont .